My post title may be just a bit misleading. I don't think there really is a way to transform hard things into "easy" things... not completely. What I'm beginning to discover, though, is that hard things can certainly get easiER. Don't hate me - but writing is one of those things that comes easily for me. Once I have an idea, I can sit on it for a while and then the words explode onto the page. The hard part, of course, is the idea! 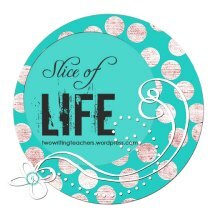 Last year when I wrote for the Slice of Life month, I had some difficult days. There were days when I just didn't know what to write about, and I had some lame posts so that I could get through the challenge. This year it was so much easier! What changed? Habit. Last year participating in the March challenge was one of my earliest experiences with consistent blogging. This year, I participated after spending an entire year sharing my thoughts on a fairly regular basis. I am in the HABIT of looking for ideas and WRITING THEM DOWN! Gee, do you think this may be something that will help kids become better writers, too? Instead, we hand them prompts and expect masterpieces. Wait - can I qualify this statement as being mostly about writing topics that work for blog posts? One of these days I'll gather some more fiction ideas, I swear. I have several abandoned ideas in a binder somewhere. I started a story last summer but it got so complex I lost the thread. I have always told myself that someday I'll be a published author - but the thought of critique terrifies me. Ah well. Now I'm trying to apply this lesson to other areas of my life. As I mentioned a few days ago, I'm committing myself to the Couch to 5K program. Nine weeks to become a "runner"? I'll believe it when I see it. I'm two workouts into it... and already I see progress. After the second workout I didn't feel like I was going to hurl AND my legs didn't turn into lumps of goo. That's good, right? Thank you to everyone who stopped by this month to share my meandering thoughts. Thank you to those who shared my thoughts with others. I hope that many of you will continue to be part of my own personal PLN over the coming year. I so agree with you! I struggled to write slices last year In the challenge...this year was a little easier although I feel like I still had some crappy posts-they are getting better though...just like with your running plan! One day at a time right?